Dumpster-diving is so ‘90’s. I must confess to being a snob, and since leaving my early twenties behind me, I abhor the idea of eating something that might be garbage, even if it shouldn’t have ended up in the dumpster to begin with. I’m picky—I don’t like my bread old our un-whole grain– and the barely expired processed stuff found on stinky, late-night forays into garbage receptacles doesn’t appeal even when it’s ‘fresh’. This is why I much prefer Berry-Leaping— to coin a phrase that denotes its purpose and properly sets it as an antonym to the aforementioned sport. Berry-Leaping can be done in daylight, with very little equipment and no after-smell. Just find a berry bush, usually of the black/purple variety and get to picking. I have used a small colander, a blue tin bucket—a-la-Blueberries for Sal — a re-used green plastic berry basket or on the spur of the moment, a large napkin. All of these work just fine. 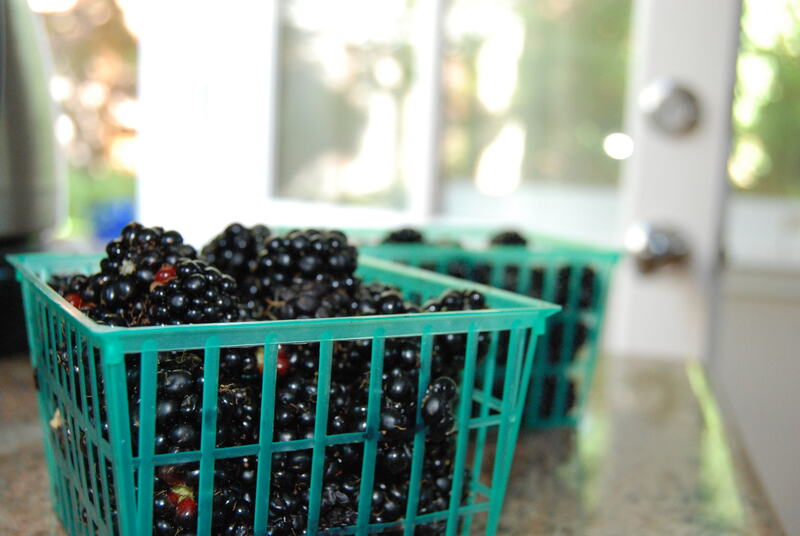 July and August are the perfect time to help yourself to wild blackberries. Most bushes are so wild and tangled that they are far more bramble than berry, but since no one has taken the time to prune and trim, no one’s laid claim on the fruits of labor, either. My advice is to taste on first—often the small, tightly packed ones are a bit sour, so choose carefully. 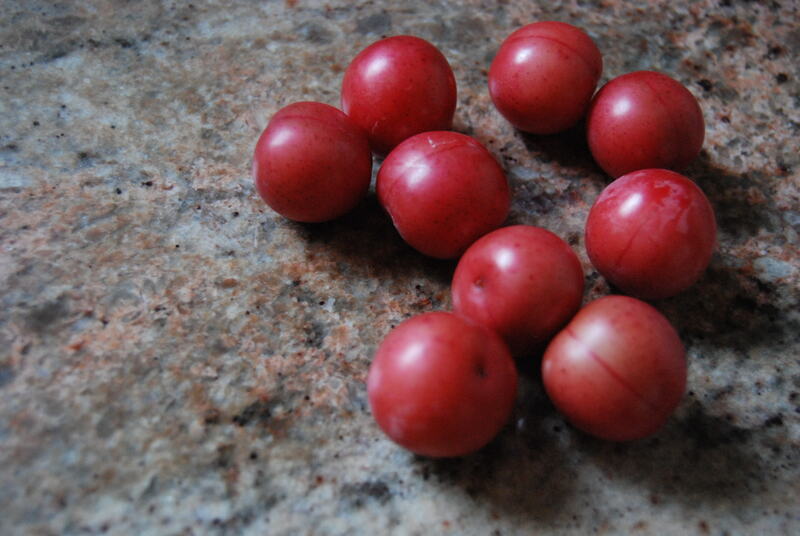 I’ve harvested the wild bushes in the no-man’s-land territory by the creek in my parent’s housing development (as well as finding some tart and lovely little plums, pictured above), and even the bushes that line the parking lot next to the gym where I teach. I just pulled my car up right below them, climbed (barefoot) onto the hood and plucked everything within reach—plenty for breakfast. I have a well-known and talented predecessor in this field (pun intended)– Alice Waters (who shares my birthday, dear Taurean Lady) used to harvest raspberries from a local vine and use them in recipes at Chez Panisse. 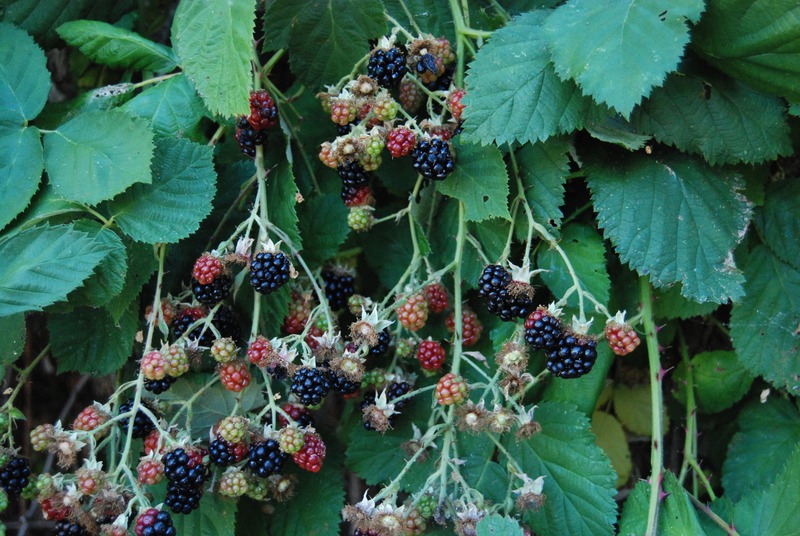 For more about how she supports the community and the future, not to mention local farmers and local wild berry bushes, check out The Edible Schoolyard: A Universal Idea . Mix it all up, until the butter is in tiny, cornmeal-consistency pieces, or the Earth Balance has moistened everything. Bake at 375 degrees for 30-40 minutes or until you can’t bear to smell it and not eat it, and all the juices are bubbly. Let it cool for 10 minutes, eat as is or top with vanilla ice cream (dairy or non-dairy, depending) and feel a lil’ bit of heaven. There’s a bounty out there for the picking—grab a bucket and a buddy and reap the harvest! Then tell me where you found your wild berries. I don’t know what the weather is doing in your part of the country (tornadoes, anyone?) but here in sunny California, it’s the 2nd of June and rainy…don’t ask me to explain. I can’t. Call it global warming or climate change or El Nino or a big, gigantic bummer. 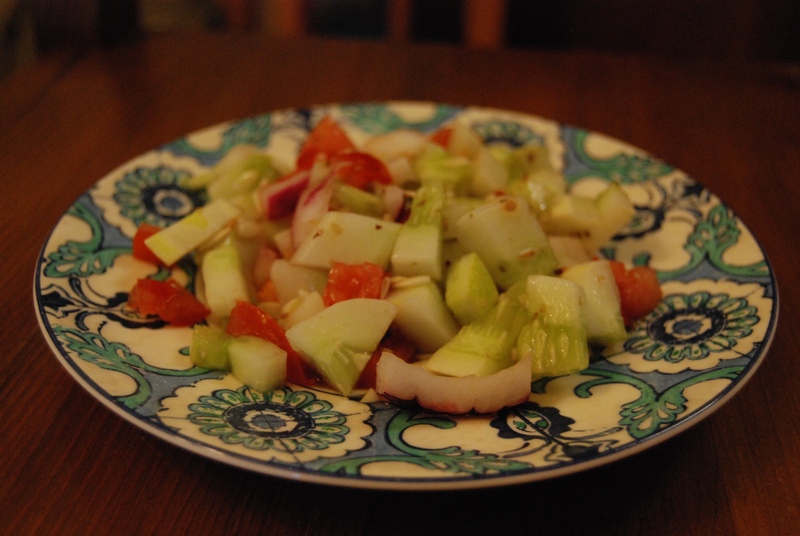 In any case, the vegetables must go on and so, I present you with Part Deux of the herb blog. Three more fantastic summery herbs are basil, mint and parsley. Parsley comes most commonly in two varieties: curly, like the stuff they garnish the plate with at Denny’s, and flat, or Italian. Reports are that the Italian leaf parsley is easier to grow (does it like lots of rain?!) but I’ve been moderately successful growing little bits in flower pots on my windowsill. Parsley is used widely in soups, chicken or minestrone, and as a garnish. I used to blend it up with my child’s baby food to add a bit more iron and they love it to this day. It is said to help both with digestion and bad breath, which I’ll go ahead and advocate through my own personal experience. If you do grow the Italian kind, go buy a couple more early summer produce at your local farmer’s market — red potatoes and snap peas, and you’re pretty much good-to-go for one of the best summer side dishes, ever. I must confess here, for good-old-fashioned-copyright-reasons that this recipe for Sugar Snap Peas and Potatoes with Parsley Pesto originally came from the now defunct and much mourned Gourmet magazine… sniff. It was a great issue, with recipes for every letter of the alphabet– a cook/librarian/mother/writer’s dream come true. Mint can appear out of nowhere, provide lovely and pure refreshment (just pop a leaf in your mouth and chew!) and rapidly take over your garden. So I put mine in a pot to rein it in. Mint typically likes shade and cool, but there are so many different varieties, found on five out of seven continents (sorry, Antarctica and South America, you’ll have to import it from elsewhere) that you’re bound to find one that’ll grow in your garden. As well as being used in food and tea, mint is also thrown into beauty products like deoderants and decongestants. In Greek mythology, it’s known as the herb of hospitality—welcome to my temple, let me feed you mint. So if you’ve got some mint in a pot, grab some and brew it with hot water for tea, or pinch off the top sprigs for sun-tea in the summer. It’s also great julienned with sliced watermelon for a simple snack with a twist. Basil is a wonderful herb – bright, zesty and easy on the egos of both amateur gardeners and aspiring chefs. Basil is the one of the reasons I love both Italian food and Thai food with equal romantic and exotic passion. Many others seem to have felt the same way, ‘cause the herbs been tended by passionate humans for over 5,000 years. Basil is at its best when fresh and barely cooked, since doing anything more than blanching it or by drying it, you kill most of its lovely pungency. Basil needs to be harvested in late summer/early fall before the first hint of frost and, in my experience, would rather be planted directly into the ground, though you may have great luck with basil in a pot under the right conditions.Plant your basil once frosts and cold weather are over, and make sure the soil is nutrient rich and has plenty of drainage. 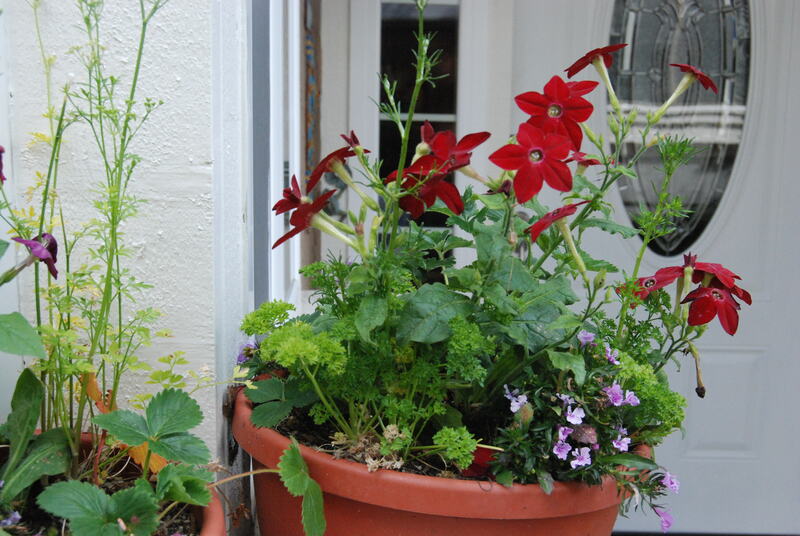 If you’re planting in a container, a lining of coarse gravel is recommended. Basil likes 6-8 hours of sunlight a day, so plant it in a sunny spot, or make sure its container is someplace where it can really soak up the sunlight. As it’s growing, make sure to pinch off any white flowers developing, so the plant doesn’t become rangy or lose the pungency of its leaves. Water daily but lightly once seedlings appear and then weekly once the plant has become established. Make sure not to spatter the leaves with water in the sunlight, or you’ll scorch your pesto—early morning is the best time to water. Harvest basil by picking the topmost bunches first and harvest part of several plants, rather than one all at once, so as to allow some re-growth. At the end of summer, dig up those suckers and go to town making pesto (see recipe below) and add it to your cache of delightful freezables. Most pesto recipes call for pine nuts, which can be expensive and often are imported. I prefer to pick up a bag of walnuts at the local farmers’ market and toast them, either in a pan or in the oven, for a few minutes (really, only a few minutes; it takes a second for them to go from toasted to charcoal) to help soften the bite of a raw walnut. The toasted walnuts give the pesto a unique, hearty flavor. Place the basil, walnuts, cheese, and garlic into a small food processor or blender and blend until coarsely ground. With the blender running pour in the olive oil until all the ingredients just begin to clump; too much oil can make it runny and, well— oily. There are all kinds of options for using pesto – add it to mayonnaise to give a sandwich a little extra flavor, spread it on pizza instead of tomato sauce or mix half and half, mix it with a little chicken or veggie stock to go over warm pasta, or mix ‘as is’ with cold pasta, olives and antipasti vegetables for a salad. If you are lucky enough to have a surplus of tomatoes, or maybe the neighbor and lucky recipient of surplus tomatoes, here’s a really good, super easy recipe with which to pair a little of your garden’s basil. Slice the tomatoes and the mozzarella all about 1/4- 1/2 inch thick. Array the tomatoes on a platter or plate (one with a bit of an edge is best, so the dressing doesn’t slosh) with the mozzarella on top. Sprinkle the julienned basil over the top evenly. Whisk the olive oil, vinegar, salt and pepper together until it has an even consistency, and then drizzle over the top of the mozzarella and tomatoes. You can serve this right away, but I find that the flavors blend even better if it’s allowed to marinate and chill in the fridge for about an hour. Here’s hoping for some sun and some summer in Northern California, but until then, eat some summer herbs for me and send some sunshine (or at least a few sunny comments!) my way.